While walking in the park on a beautiful sunny day, the air as crisp as blue, I spotted a snail obstructing my path. Seriously? How could such a tiny critter arrest my attention so completely? I’d never seen a snail, except curled up safely inside its lovely striped shell or on a restaurant plate as a delicacy. Now here was one, opened out and moving, her minuscule body stretched out in front and in back of the shell’s closure, and all her wee feet milli-inching along. I stopped to watch her journey, fascinated by attributes I admire, such as diligence and determination. Undaunted, this critter was on the move. On the move might be an exaggeration. I called a passerby to look with me. She was amazed. She had never seen a snail on the move before.We exclaimed together while I took some photos of the snail, whom I quickly named Swifty. I stayed for a while to watch. This was her coming-out party, I figured. I snapped another photo, gave her a little blessing, and wished her well. Here’s Swifty herself. She is a modest soul, full of gumption and sure to be stepped on by one of the many walkers and players who sport about in the park. from a branch, its baby nestling on its breast. proclaims the joy of a life which is one long rest. fourteen feet per minute, in a race with fate. a race so determinedly unenergetic? What passion ever inspired a sloth to mate? 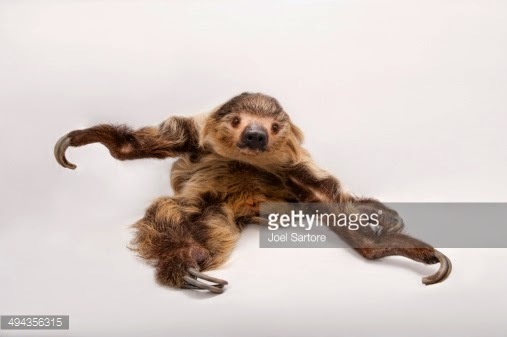 Recent National Geographic trivia: Sloths rest 20 hours out of 24 in the day. Their metabolism is so slow they climb down to defecate only about once a week. How do they reproduce? How love? Sloths are quick when it comes to love-making. Fall over laughing. Well, here is a possible answer to my question: the Church is an institution freighted with such an obligation to love, and such a duty to serve, and such a compulsion to be sensitive to everyone’s needs, that reform takes a very long time—a very long time, indeed. Perhaps this is the way with any institution, but religious ones take longer, in part because they are beset with the devilish question: What does God want? It is a question easily deployed to keep us stuck. From Swifty, the snail, I learned that slow is also determined. Slow-moving devotion is a gift. Say the word, slow, slowly several times on the exhale, and you can feel yourself slowing down all over. Sometimes I move too fast. And from the noble inverted sloth, I learned that when love is involved, with a dash of lust and procreative necessity, even the slowest creatures on earth can move very fast. The Church of Christ is in danger of not reproducing. It values slow-moving devotion and fast-moving love—planting seeds of compassion wherever there is need, and doing it without fuss and feather. Our balance is off—too much determined devotion and too little fast-moving love for its own sake. If a sloth can quicken love, I guess we Christians can, too.